Book DescriptionThis book brings together the two greatest names in the history of chess. The author, Garry Kasparov, is the world number one and, by common consent, the greatest player ever. The subject of the book, Bobby Fischer, is the only American to have become world champion and is probably the greatest natural talent the world has ever seen. In the period between 1955 and 1972 Fischer, more or less single-handedly, took on the might of the Soviet Chess Empire, and won. During this time Fischer scored astonishing successes the like of which had not been seen before. These included 11/11 in the 1963/64 US Championship and match victories (en route to the World Championship) by the score of 6-0 against two of the strongest players in the world, Mark Taimanov and Bent Larsen. The climax of Fischer's campaign was his unforgettable match win in Reykjavik in 1972 against Boris Spassky. Fischer is almost equally well-known for his temperamental behaviour away from the board, as his play on it. He made extreme demands of all those around him including tournament organisers. When these demands were not met he often refused to play. The 1972 match against Spassky required the intervention of no less than Henry Kissinger to smooth things over. In 1975 when he was due to defend his title against Anatoly Karpov, Fischer was completely unable to agree terms with FIDE (the World Chess Federation) and was defaulted. After this he more or less gave up chess, playing only once, a 'return' match against Spassky in 1992. 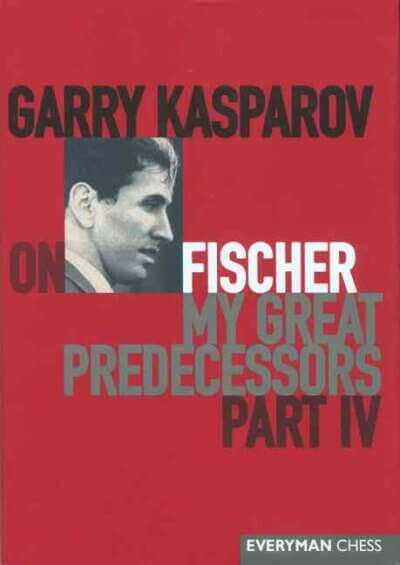 In this book, a must for all serious chessplayers, Kasparov analyses deeply Fischer's greatest games and assesses the legacy of this great American genius.